The Indian Head Cent, which debuted in 1859, averaged a mintage of 18 million annually, until 1877, when production suddenly declined to only 852,000. Relatively few cents were issued in 1877 because the Mint had a sufficient supply of older cents in storage to meet reduced demand for coinage that year, due to soft economic conditions that began four years earlier. In September 1873, a major financial firm, Jay Cooke & Company, declared bankruptcy, following a failed attempt to sell bonds for the nation's second transcontinental railroad. This triggered a chain reaction of bank failures and a temporary closure of the New York stock market. Many factories, railroads, and other businesses were forced into bankruptcy, sending the US into a major depression. This crisis was called the "Panic of 1873". By 1875, unemployment exceeded 14%, with over 18,000 companies going out of business. In addition to smaller demand for coinage because of the poor economy, the Coinage Act of 1873 also reduced the need for new cents in 1877. The Act provided for an exchange program non-precious metal coins for bronze cents. By the time 1877 rolled around, redemptions were paid out with cents from previous years held in Treasury vaults, further reducing cent requirements. In 1878, mintage jumped to 5.8 million, the beginning of a steep rise in production. Numismatic researchers have reason to believe far fewer than the reported 852,000 pieces for the 1877 cent were actually struck. All known 1877's were struck with the same reverse die. In those years, it was unusual for a die to last beyond 100,000 strikes, lending credence to this theory. This may explain why the 1877 is valued higher than the 1909-S, which has a reported mintage of 309,000. The 1877 Indian Head Cent is considered by most collectors to be the most important date in the popular Indian Head series. 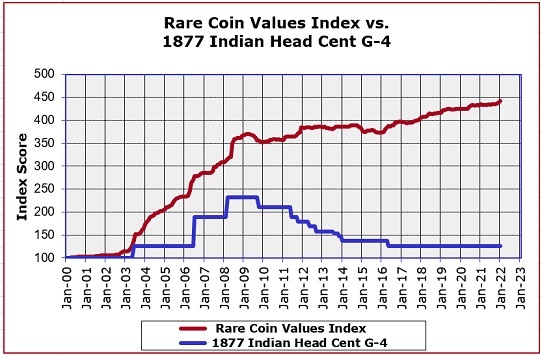 The 1877 Indian Head Cent is one of the best known rare coins in all of numismatics, but surprisngly, it falls below the overall average of the Rare Coin Values Index. The blue line above graphs the percent change since the year 2000 in retail price of the 1877 cent in G-4 condtion, starting at a baseline index of 100. The red line demonstrates the overall direction of the rare US coin market since 2000 as calculated by the Index. The 1877 Indian Head Cent is one of 87 rare US coins that comprise the Index. The Index is updated monthly.